The lost wisdom seeps out from the depths of the ancient tombs, dark and beautiful. The only truth lies in the deep fantasies of the imagination. That is where one will find respite and sanctuary, magic and beauty. This work by Myrrdin slowly approaches that strange twilight, easing one into the depths of synthetic mystery, until before one realizes, the world around oneself fades into the fantasy realm of the dreaming mind. It hovers like a ghost of some uncertain dimension, where remembrance of that golden city remains. Straight-faced, this spirit promises a land beyond an endless river, a land in which streams of sparkling diamonds run freely into the black sea that only the White Ship dares sail. This is probably an album I should've reviewed quite a while ago, considering that it is relatively new, obscure, and one of my favorites. Exploring both the antique as well as spacey patches, this work majestically flutters over a dynamic landscape, at some moments quaint and nostalgic, at others deep and mystical. It is a work that I feel epitomizes the genre, and it is damn-well composed. Though this album has synths that very much contain the "dungeon synth sound," they are not of the dirty and forlorn variety. Instead they are rich and magical, having a vintage aspect no doubt, but certainly not a "cheap" sound. Rather, the timbres have an luxurious quality, as of a strange fabric sold by exotic merchants who traveled from some unknown, distant jungle. In terms of the composition, this is not one of those oft-listed dungeon synth records that maintains the same several chords for a whole hour. It is quite varied, contrasting several darker riffs with the more majestic and beautiful ones, making the latter all that much more powerful. The riffs never linger, yet nor do they depart before their spell has been cast; it wanders at a comfortable pace, allowing the listener to view every enigmatic vista in his own time, but never forcing him to remain and look too deeply. It is quite easy on the listener, not requiring much work on his part to appreciate the beauty here, and yet I feel that hides a powerful complexity and uniqueness of vision. This work only expects its listeners to explore the surface encounters of these beautiful images, as is very natural for a mind observing music indirectly, whether as background ambiance or nearing the dream-state. But that is not to say that there is nothing below that surface, only that those lower and more obscure atmospheres, those "between the notes," so to speak, are delivered subconsciously, and arrive like unremembered dreams. I sense a Mortiis influence, however that is only vaguely through the atmosphere. 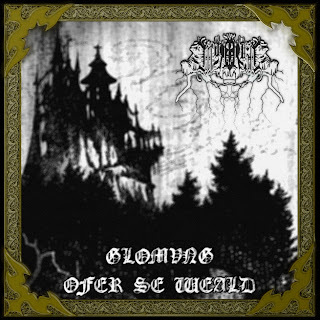 While Mortiis sounds like decadent kingdoms, tyrannical kings, and rotted, undead mages, this sounds more like high magic: vast floating cities and immensely-powerful, benevolent, absent-minded wizards of a great old order that has matured into a trusted council, ruling the kingdom with their mystic wisdom. Although that picture in my mind could very well be due to the highly imaginative title of the best track on this album, "The Court of the Elder Star-Finders." This track has a mystery and darkness very much conveying the infinitude of space, and yet acknowledging the intrinsic magic of the obscurely-shining cosmos, which a wise and mighty sorcerer can look to for understanding, of both this world as well as untold secrets of the beyond. And that is the greatest thing both about this track as well as the album in general, that it conveys utmost mystery. One feels both that the ultimate answers will be infinitely out of grasp, and yet at the same time that obscure, incomprehensible knowledge, as well as experiences of bizarre and alien vistas, lie right beyond our fingertips. I discovered this album a few weeks ago myself, and I've been loving it. You're dead on about it having a beautiful surface appeal, but with a great amount of subtlety to it. Your review definitely does it justice, and I can tell a lot of love and work went into it. Cheers!